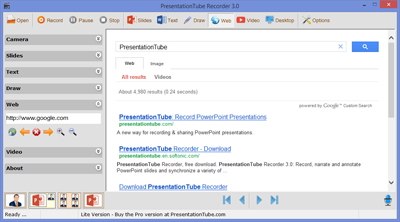 PresentationTube Recorder is a simple tool designed to help instructors, students and business professionals record their presentations from the comfort of home or office, and without the need to have Internet connection while recording. 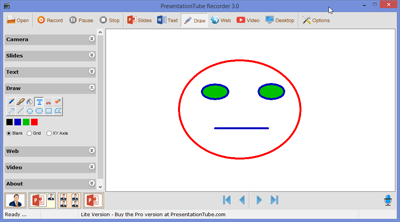 The Recorder synchronizes a variety of visual aids including PowerPoint slides, Webcam streaming, whiteboard, drawing board, Web browser content, Desktop recording . 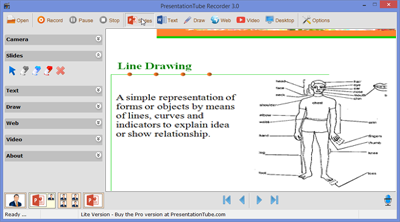 With visual aids, like the drawing board, presenters can draw lines, curves, graphs, and shapes on the screen to emphasize or clarify their ideas, so the demonstration can be clearer. 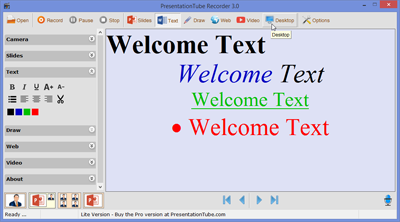 The whiteboard helps presenters to type text while presenting using the keyboard making it an ideal tool to add more details, or explain equations using words, numbers, and symbols. Currently available for Windows only. 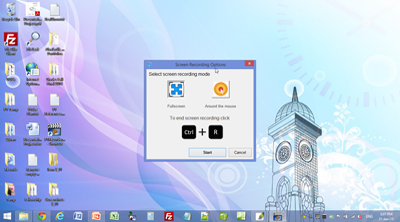 Mac, iOS and Android versions will be available in the near future.